By adding High Speed machining operations into your part-making process you can achieve excellent results faster than by using traditional offset toolpaths. It isn’t only just for 2 Axis CAD-CAM programming anymore. The latest CNC machining technologies in CAD-CAM software include High Speed Machining operations for 3 Axis as well as 4th and even full simultaneous 5th Axis CNC Milling. The following CAM Clip video shows a direct side by side comparison between these two types of machining operations and how they relate to CAD-CAM software for advanced CNC metalworking. Traditional offset toolpath has been the most common form of toolpath in use since the advent of CAM software. However, as more and more shops begin to use HSM they are trusting it more, becoming less critical and beginning to enjoy the benefits of it. The goal of using a trochoidal form of machine path is to limit the number of collisions that the cutting edge of the tool has with the material, reducing chip load, better utilize the cutting tool itself by using more of it while taking deeper cut depths and all while at much higher speeds. 1. The controlled arc of engagement generates low cutting forces which enable high axial depths of cut. Multi-edged tools can be used which enable high table feeds with secure tool life. In other words, deeper cuts can be achieved easily. 2. The whole cutting edge length can be utilized ensuring that the heat and wear are uniform and spread out, leading to longer tool life. 3. There is a constant tool engagement, deeper cutting and NO stop and go. 4. High Speed toolpaths are excellent for slotting and pocketing when vibration is a problem. 5. Much higher speeds are used resulting in superior finishes due to a number of factors (reduced tool deflection, vibration/chatter etc.) while machine cycle times are vastly reduced. Shorter cycle times on jobs. High speed machining can help a CNC shop manufacture more accurate parts with better surface finishes. And often, because a machine tool and workpiece setup has to be very rigid for high speed machining, the results are more consistent workpieces. All of this together amounting to higher efficiency in CNC programs, machining and in the end, increased profitability for a CNC business. CAD-CAM software is an absolute necessity for the creation of these types of machining toolpaths. Without CAD-CAM software they wouldn’t exist today. The benefits listed here outline all of the reasons why shops should take advantage of this technology. 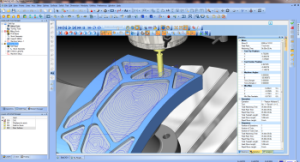 And now, high speed adaptive roughing strategies are being made available in BobCAD-CAM for Multiaxis CNC machining for the first time, opening the door for even more complex CNC work to take advantage of its powerful abilities and profit-building results. Machine time is money and the reduction in cycle times that lead to faster turn-around, happier customers, better finish results, reduced tooling expenses and a longer life for your CNC machine tool all equal profit and better business practices.